Essex Junction ~ University of Vermont History Professor Emeritus Mark A. Stoler will examine the important personal relationship between Britain’s Prime Minister and America’s President during their World War II alliance in a talk at Brownell Library in Essex Junction on May 1 at 7:00 pm. 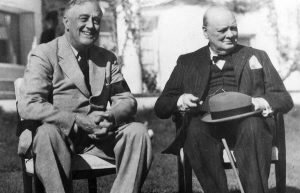 His talk,“Churchill and Roosevelt: The Personal Element in Their Partnership,” is part of the Vermont Humanities Council’s First Wednesdays lecture series and is free and open to the public. Stoler is professor emeritus at the University of Vermont and co-editor of The Marshall Papers. Dr. Stoler is a distinguished military and diplomatic historian and author of numerous books, including the acclaimed biography of Marshall, George C. Marshall: Soldier-Statesman of the American Century. In addition to teaching at UVM, Stoler has served as a visiting professor at the U.S. Military Academy at West Point, the U.S. Naval War College, the University of Haifa in Israel, the U.S. Military History Institute, Williams College, and Washington & Lee University. He is former president of the Society for Historians of American Foreign Relations and a former trustee of the Society for Military History. The Vermont Humanities Council’s First Wednesdays series is held on the first Wednesday of every month from October through May in nine communities statewide, featuring speakers of national and regional renown. Talks in Essex Junction are held at Brownell Library unless otherwise noted. The program is free, accessible to people with disabilities and open to the public. See the full schedule of Essex Junction First Wednesdays talks. “Churchill and Roosevelt” is underwritten by Lisa Schamberg and Pat Robins. Brownell Library is sponsored by Brownell Library Foundation, Inc., The Essex Agency, Inc.; Kolvoord, Overton & Wilson P.C. ; Northfield Savings Bank; and RETN.